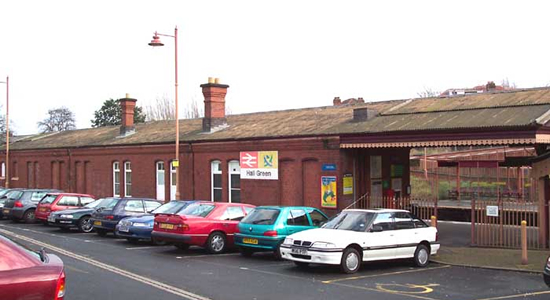 A good example of a turn-of-the-century GWR station is Hall Green which opened in 1908 with the opening of the North Warwickshire Line. Apart from some signs of neglect and the loss of what were at best meagre facilities on the Stratford platform, nothing much has changed inside the station over the last 100 years. 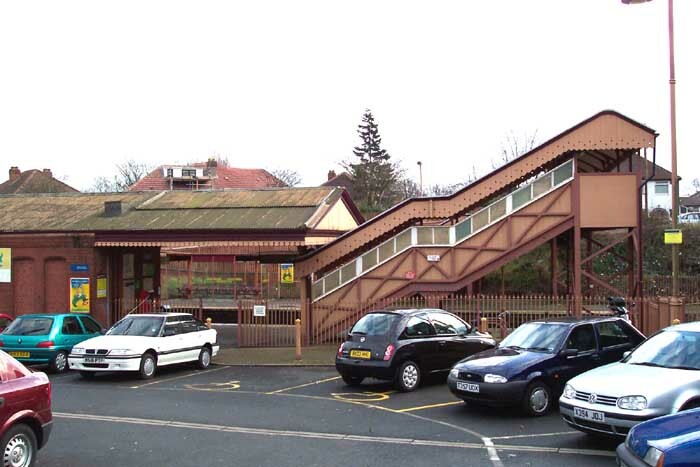 Above we see the station building and entrance to the station from the car park on Station Drive - compare this building with those at Henley-in-arden and Shirley to get a good perspective on GWR architecture at the turn of the last century. Above-left we are again in the car park but have moved back a little from the point at which the previous photograph was taken so that we can take in the detail at the end of the footbridge. 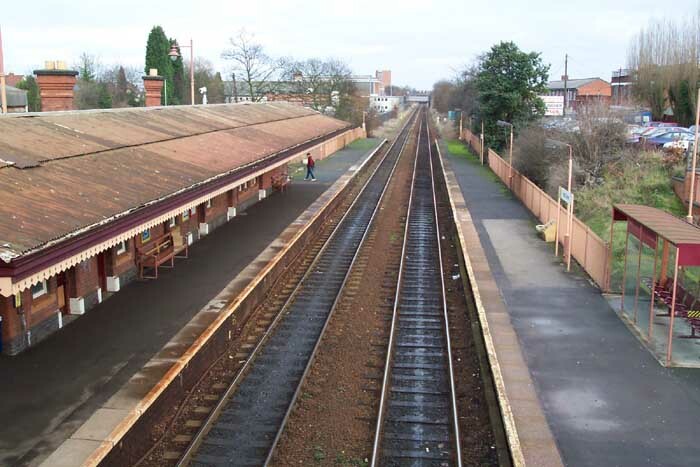 Above-right we are on the Birmingham platform looking in the direction of Birmingham with the station building immediately behind and to our left. 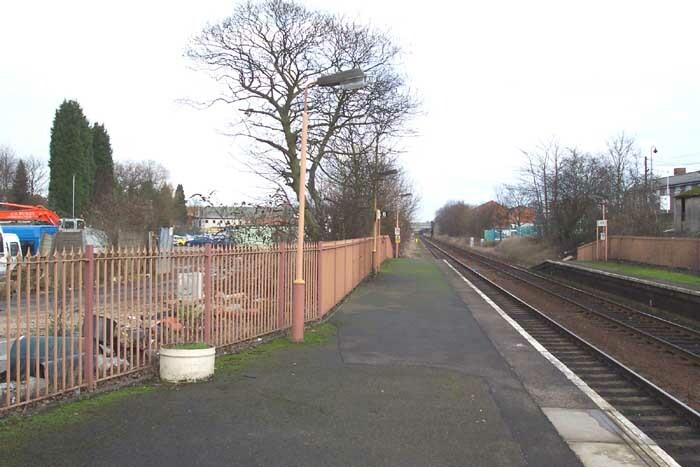 I assume, but am not certain, that the area to the left of the original GWR 'spear' fencing was a goods yard - Many thanks to David Direktor who has confirmed that this was indeed the case: "I can confirm that there was a goods yard and coal merchant there. The goods yard, among other things, handled PLA (Passenger's Luggage in Advance) which included pickup from home (i.e. my school trunk each term)". Much appreciated! Above-left we are in the same position as the previous photograph but this time looking towards Stratford to get a good impression of the entire station and the extent to which the station building has escaped the 1970s 'rebuilding & rationalisation' escapades of BR and the WMPTE almost completely unscathed - note the typical wooden edging to the platform cannopy. At the base of the footbridge on the Stratford platform is the only noticeable absentee from GWR days - there was once a waiting room at that spot. 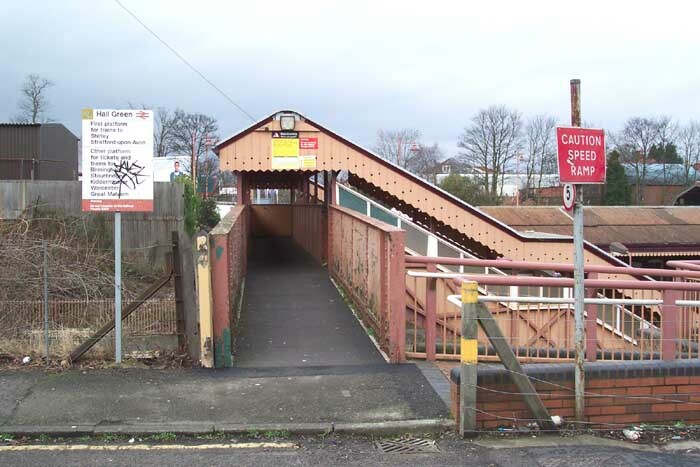 Above-right we have crossed to the Stratford platform and are looking through the footbridge to the Stratford Road overbridge in the direction of Stratford. Above-left we are looking at the Birmingham platform and station building from the Stratford platform. The door at the near-end of the building used to be the gents toilets but it appears locked and disused now - probably the result of vandalism which has caused the facilities at many stations to be withdrawn. 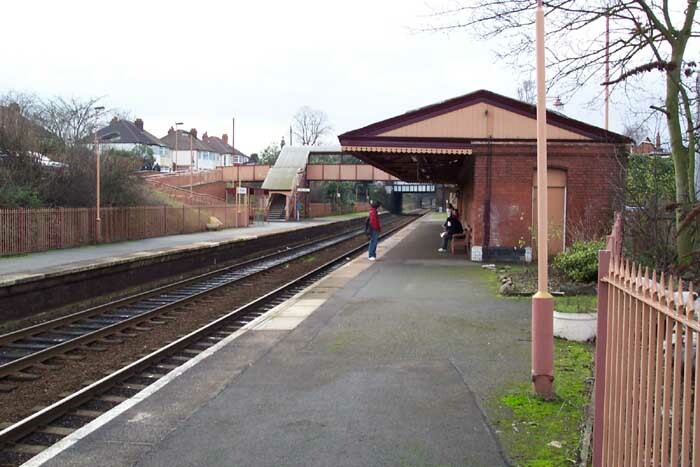 Above-right is a closeup of the spot where once the Stratford platform waiting room stood. Usefully however, a disabled access ramp has been built in its place which is useful as the Stratford platform side of the station is in a cutting. 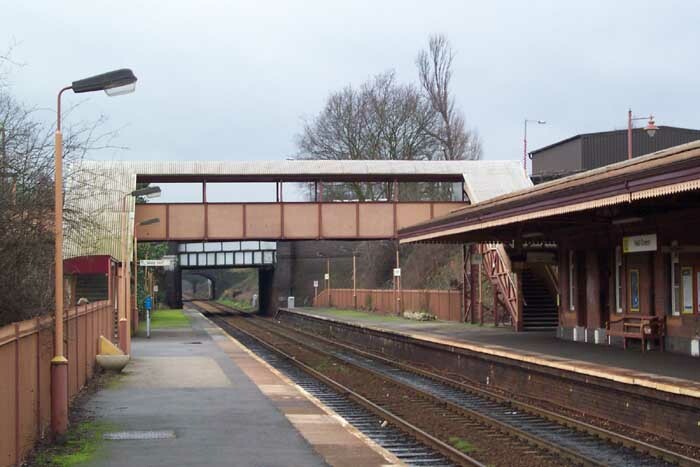 Above-left we are on the footbridge looking at the whole station in the direction of Birmingham and above-right we are on Welby Road looking at the other entrance to the station. 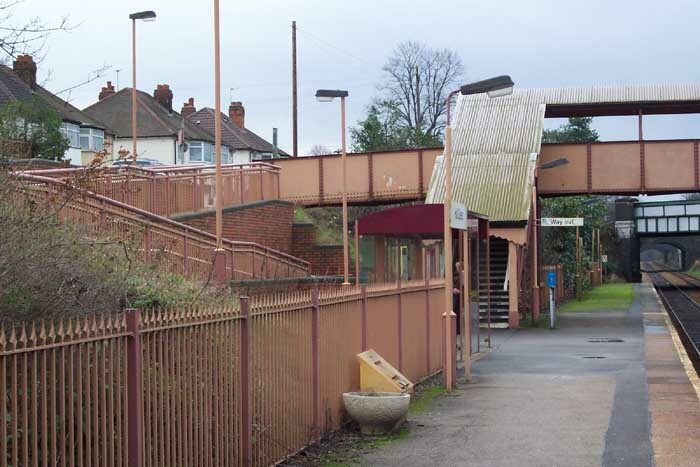 As was mentioned earlier, the Stratford platform side of the station is at the bottom of an embankment hence the entrance from this side is at the level of the footbridge as we can see here. 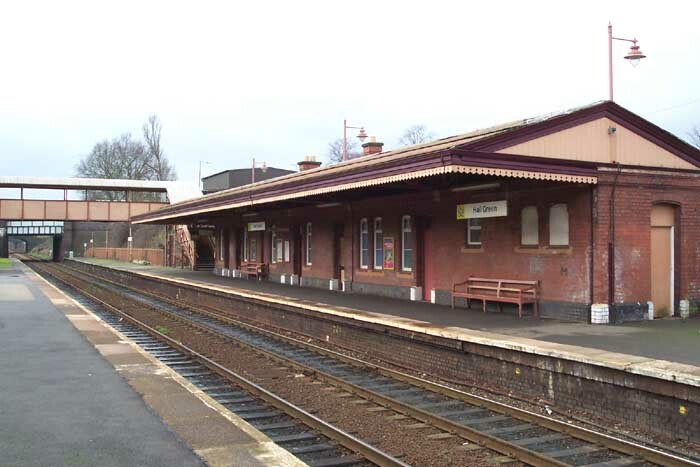 For a good example of GWR architecture you could do a lot worse than come and visit this station.